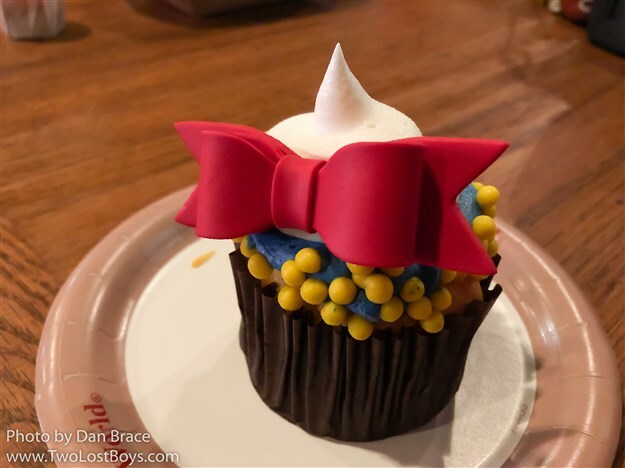 At Restaurantosaurus, you can get a special Donald themed cupcake, which we tried. 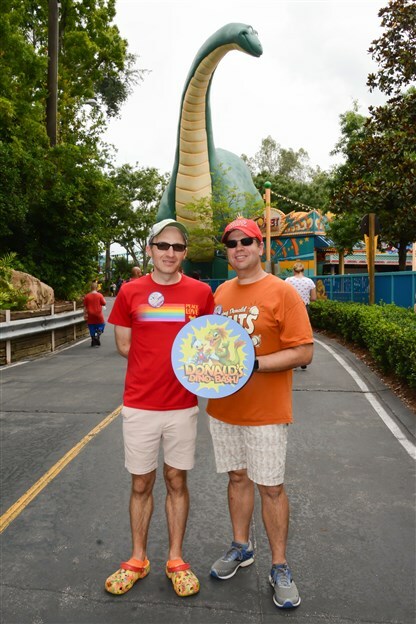 It was pretty good, if exceptionally sweet, though. 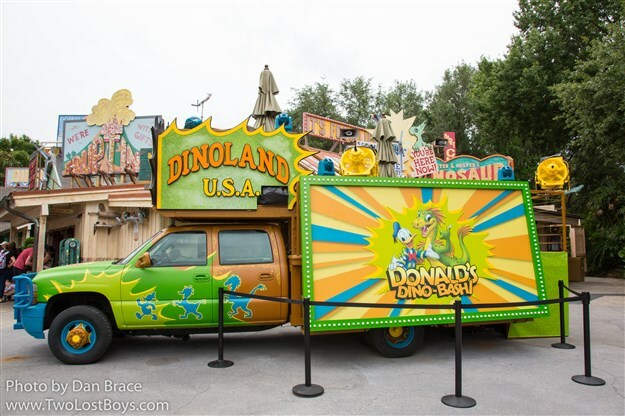 If you love to collect all the special PhotoPass opportunities, like we do, then there are two new ones in Dinoland that you can get. 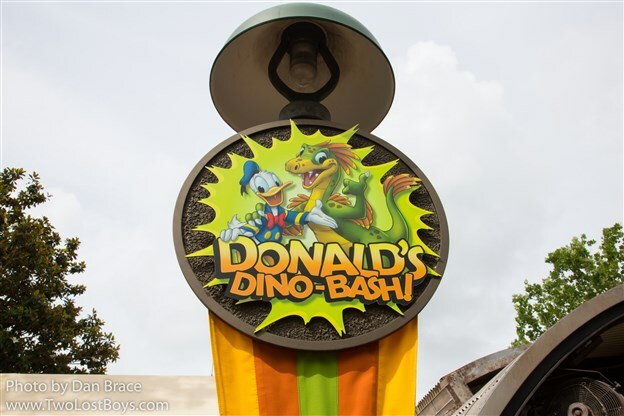 You can hold the special Dino-Bash! 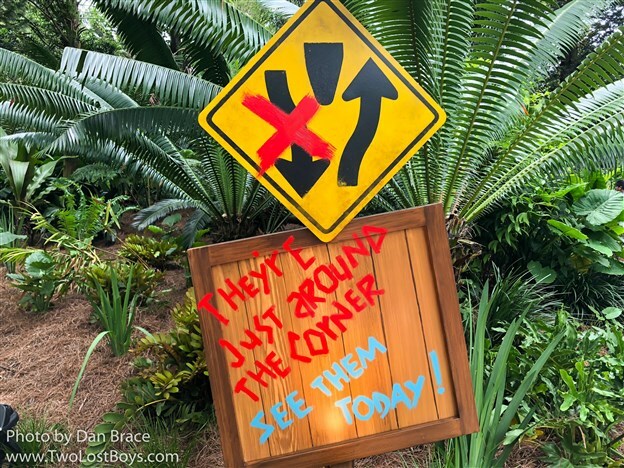 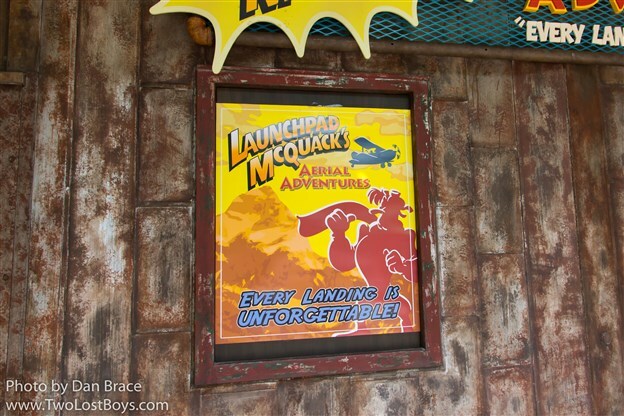 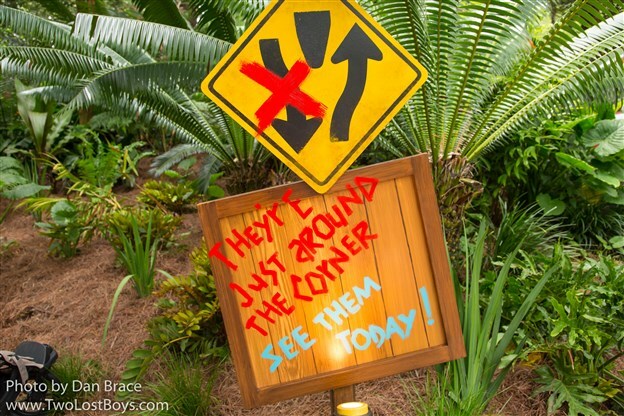 sign, and you can get your picture with Donald's nephews, Huey, Dewey and Louie. 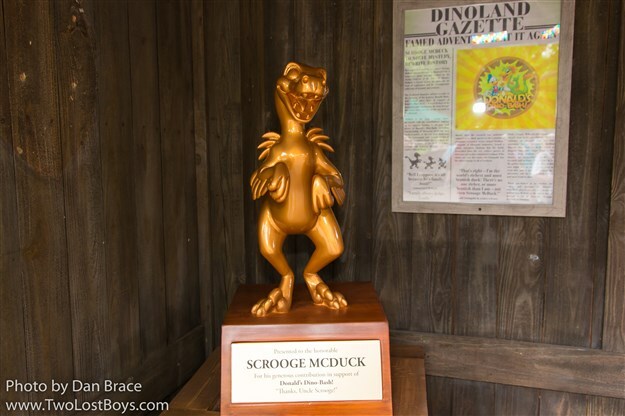 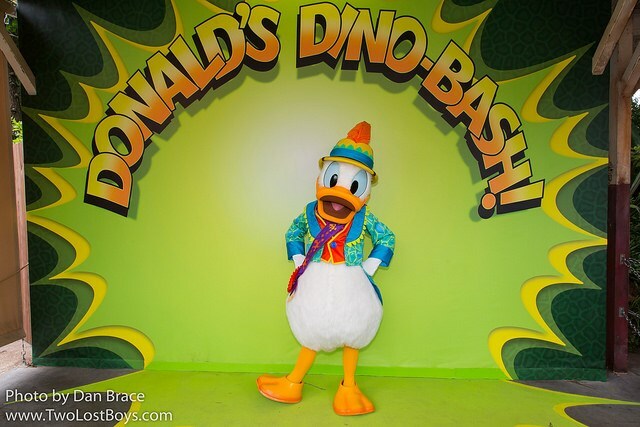 Since this is Donald's Dino-Bash!, the party would not be complete without the main duck himself in attendance! 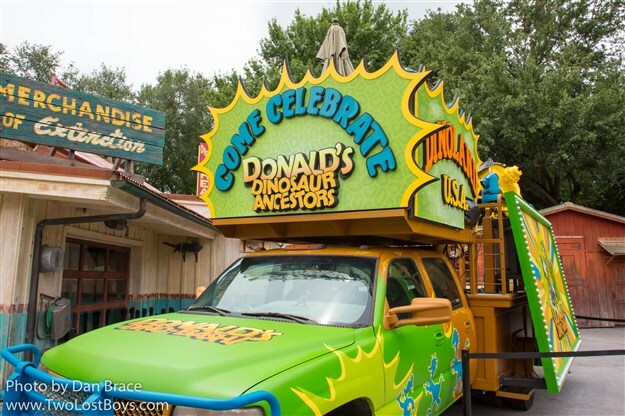 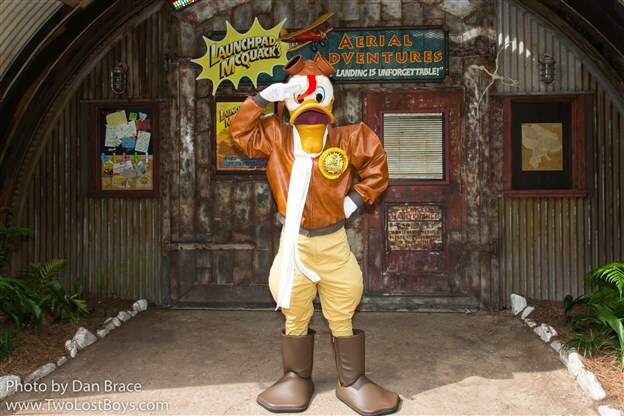 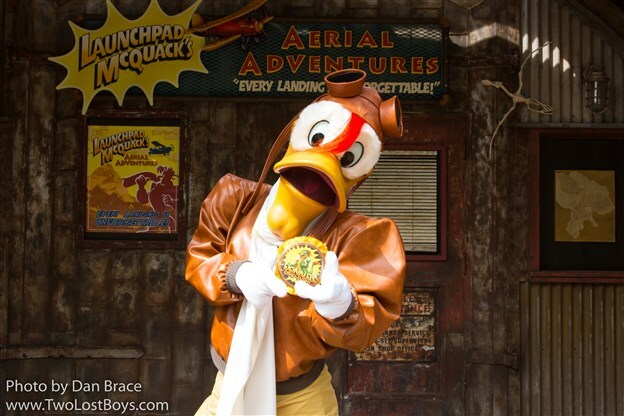 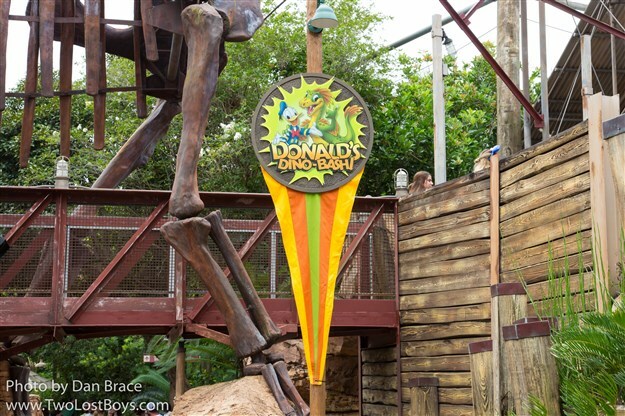 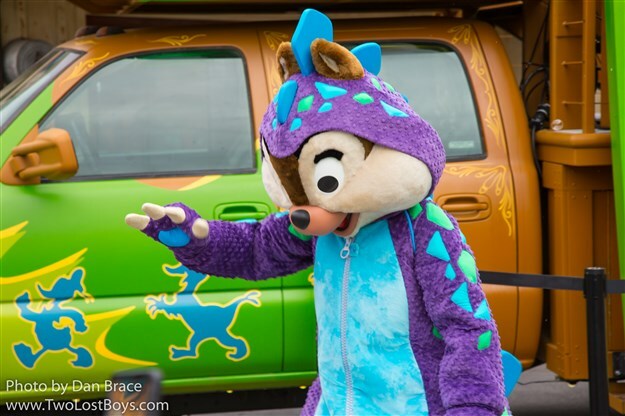 You can meet Donald in his special Dino-Bash outfit at his new location opposite Chester and Hester's Dino-Rama. 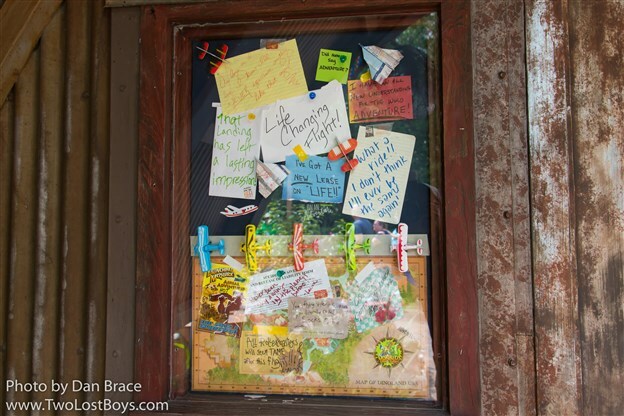 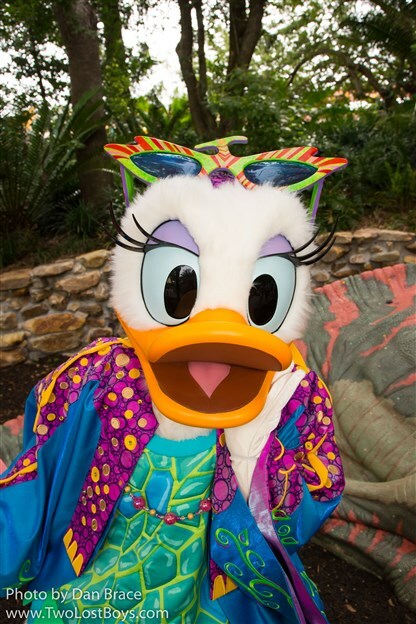 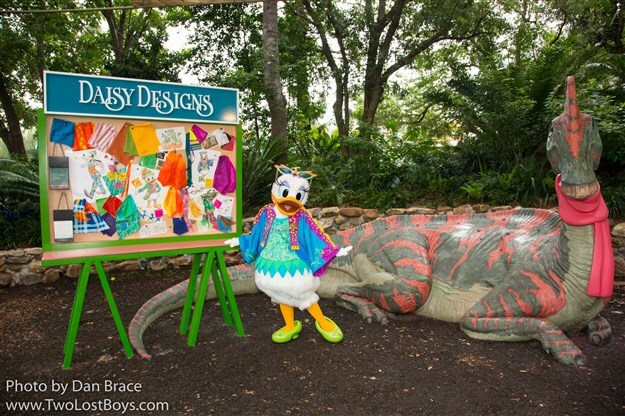 Daisy Duck designed the outfits for the new party, and can be found at her drawing board around the corner from Donald, along the Cretaceous Trail. 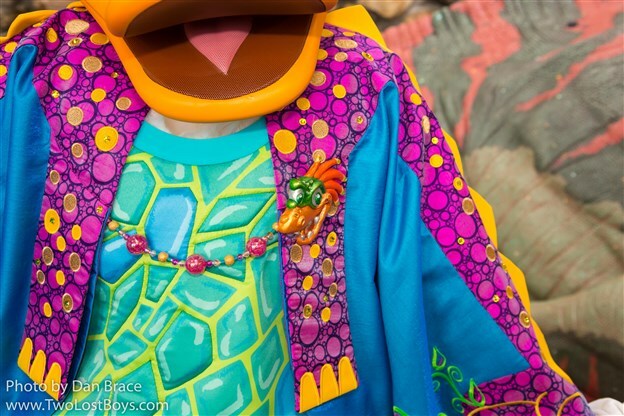 We just love her pterodactyl sunglasses! 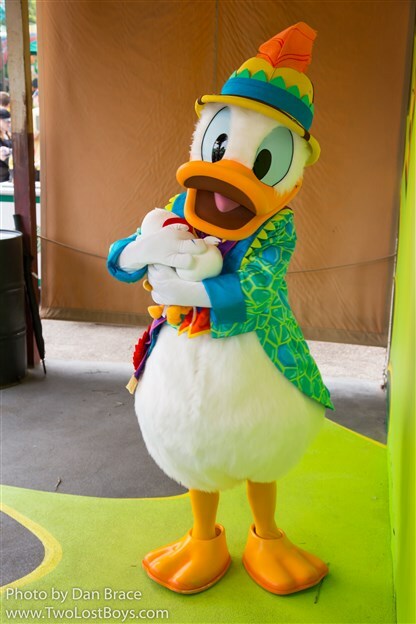 Donald of course invited his other friends along to the party, too. 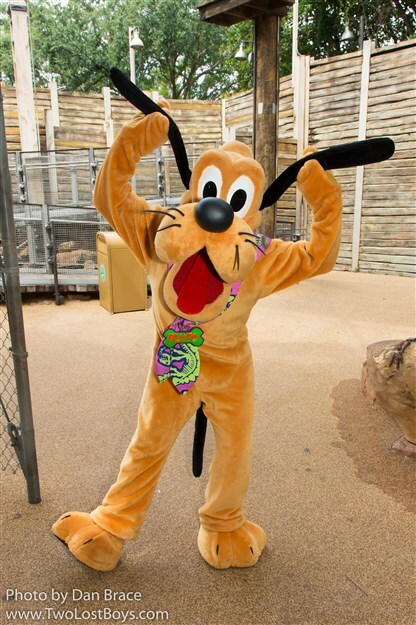 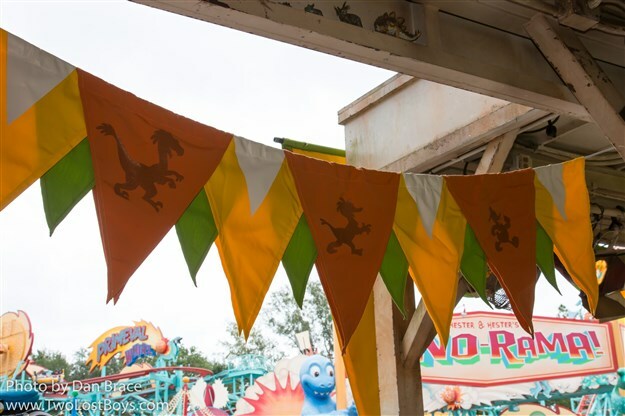 You can meet Goofy and Pluto in their special outfits inside Chester and Hester's Dino-Rama and the Boneyard, respectively. 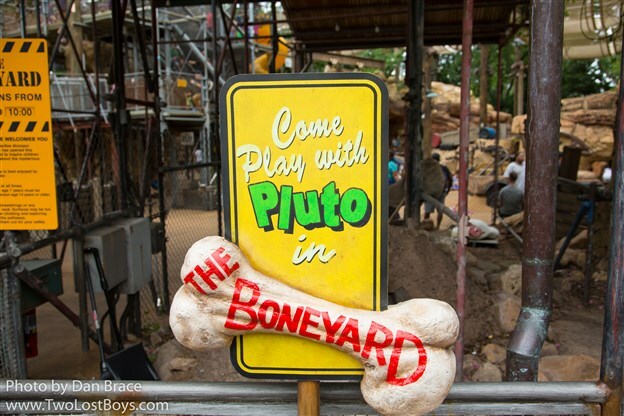 Pluto doesn't have a line in the Boneyard, but instead roams around, stopping for photos for those who want them (I mean, who wouldn't though?!). 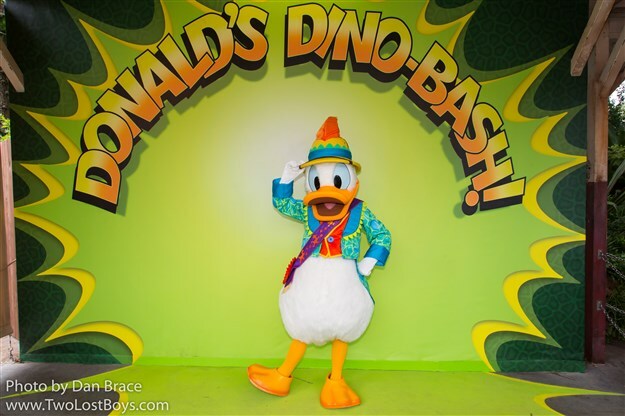 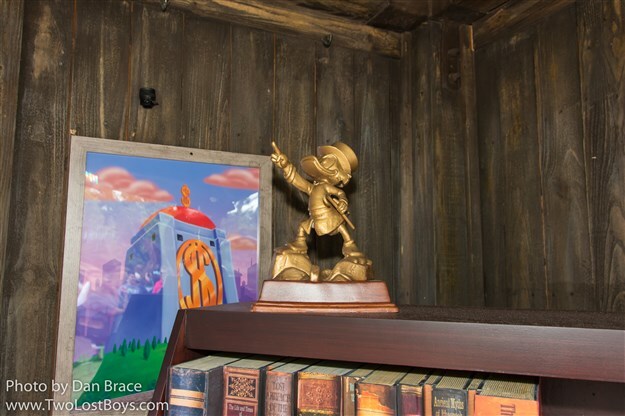 In a bolt of inspiration, that for WDW is seemingly miraculous in nature, Donald was also allowed to invite two very special guests to this new party - Launchpad McQuack and his rich uncle, Scrooge McDuck! 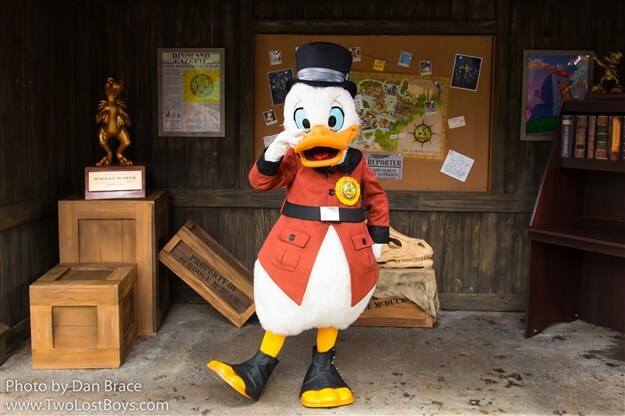 They both get to wear special rosettes, and Scrooge even dug out his classic red jacket for the occasion! 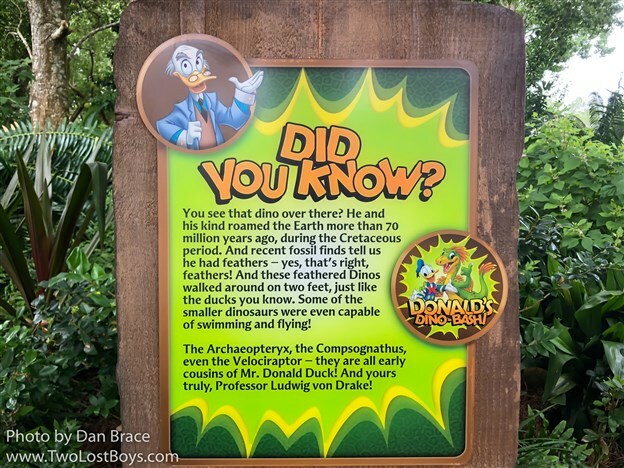 A rare sight indeed! 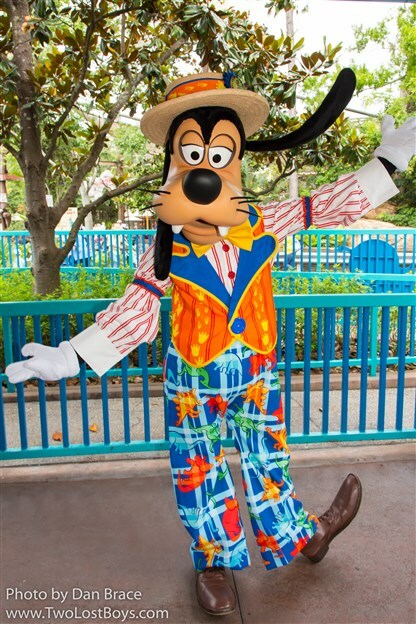 I deliberately saved the best for last, and who could blame me? 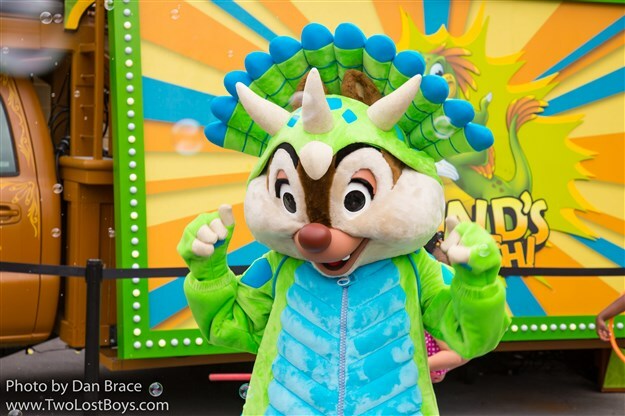 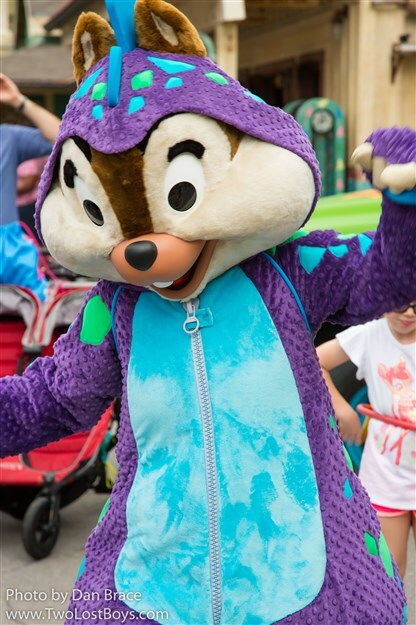 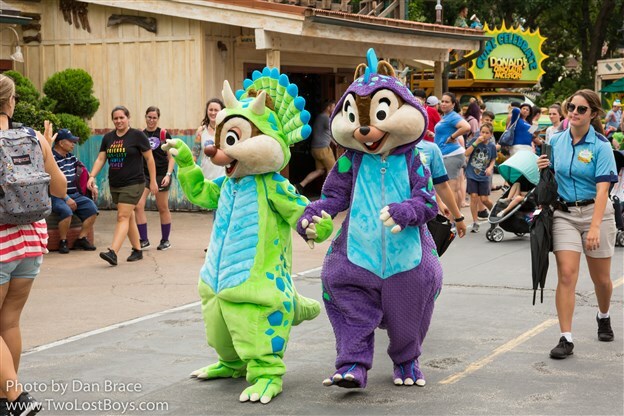 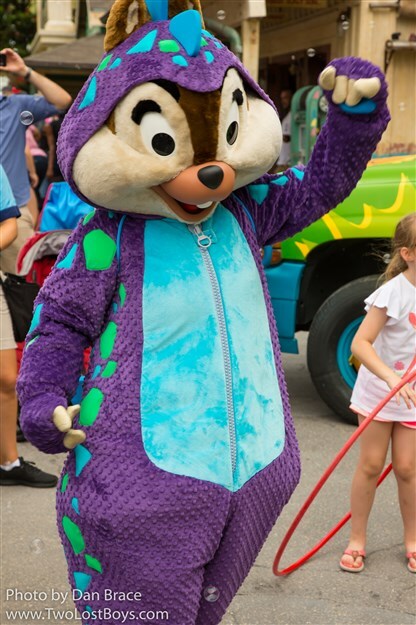 By far the best outfits of all eight characters appearing for the Dino-Bash - and in Jon and I's opinion, amongst the best ever created - are Chip 'n' Dale as Chipmunk-o-saurus. 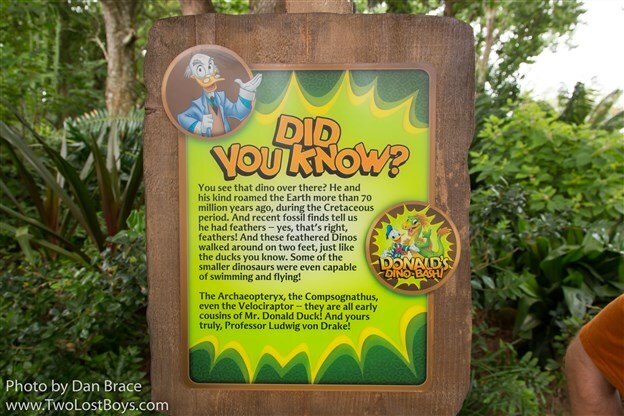 Appearing along the Cretaceous Trail, they are ridiculously adorable, and steal the entire event. 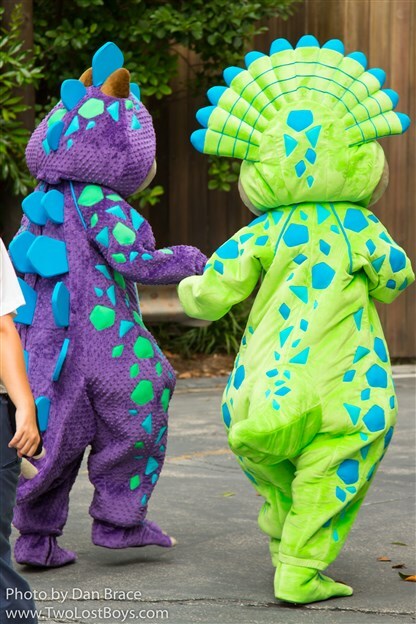 We hope they stick around for a long while to come. 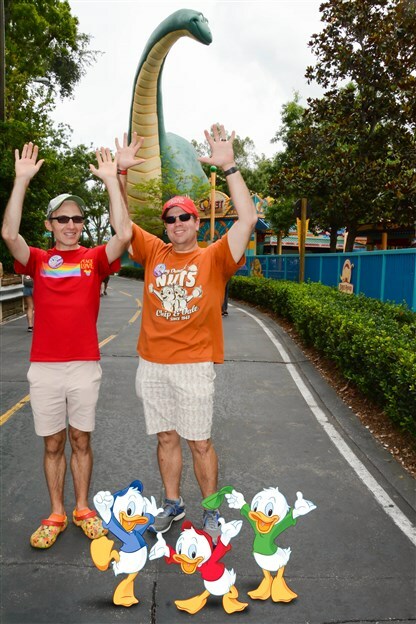 It wouldn't be WDW if there wasn't the token dance party, and so, yup, there is one. 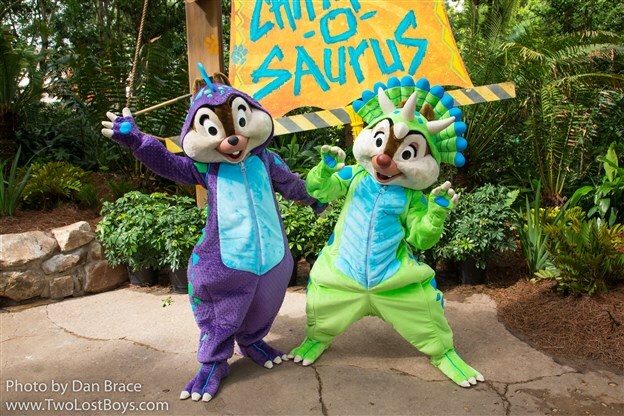 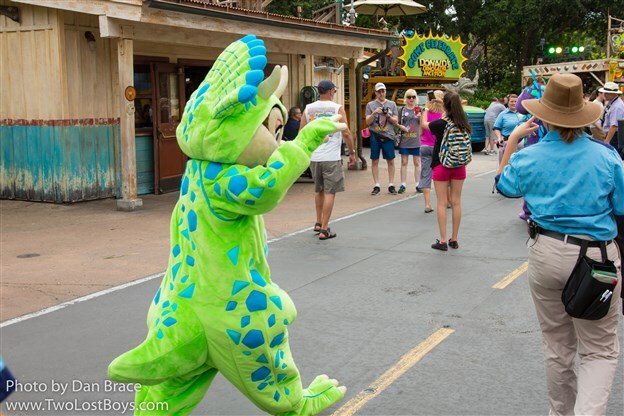 While we dislike the dance party concept in general, if you ever needed an excuse to throw one, it would be because Chip 'n' Dale appear dressed as dinosaurs. 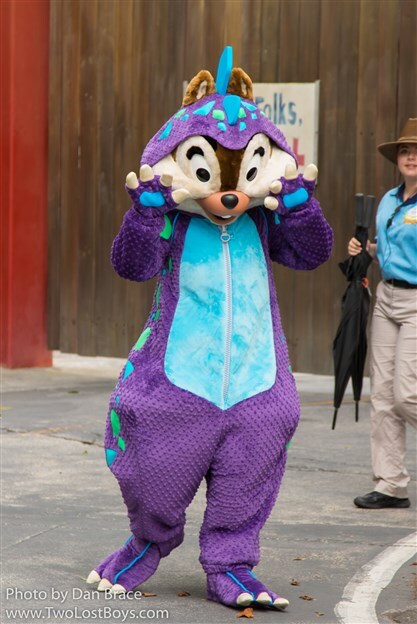 Cue hundreds of photos. 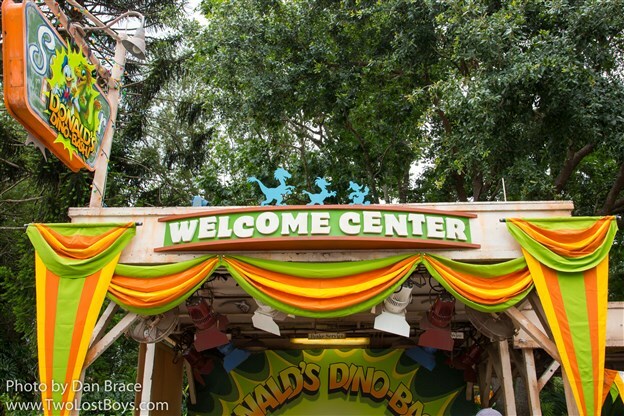 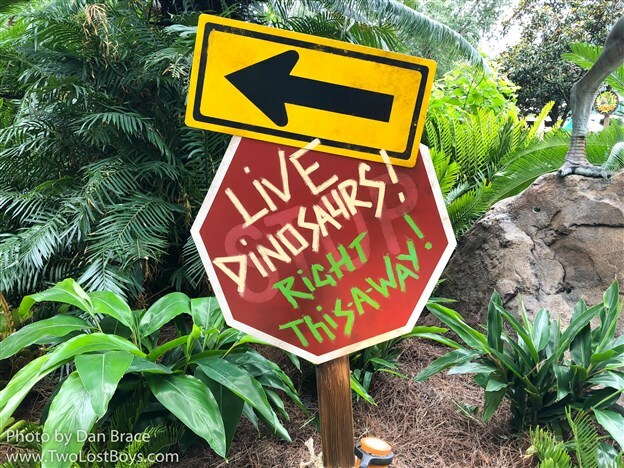 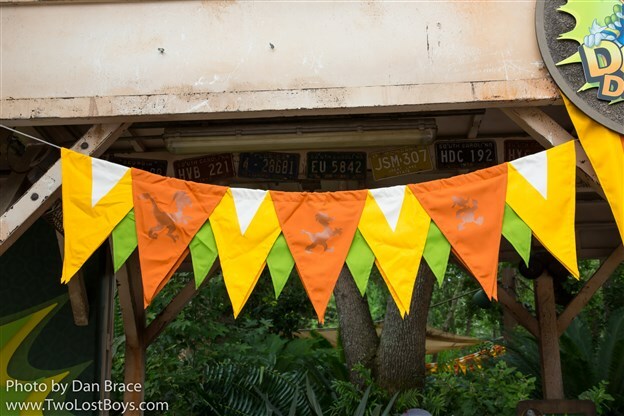 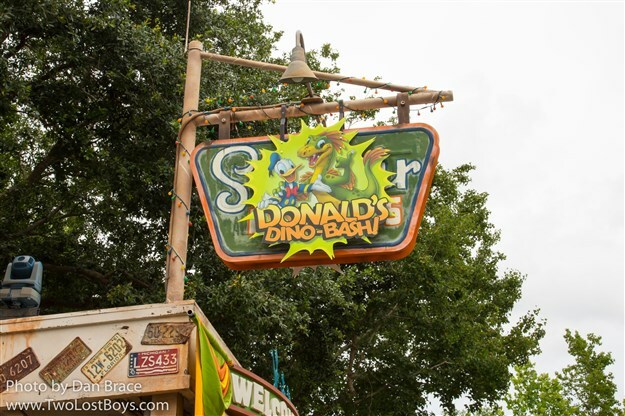 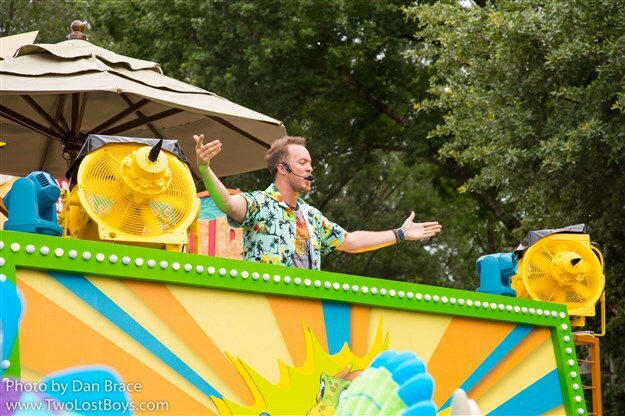 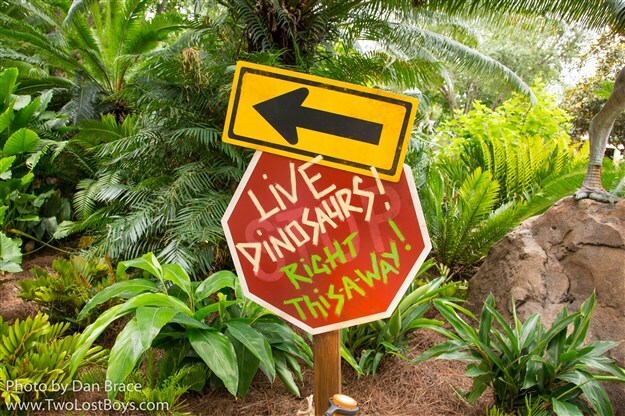 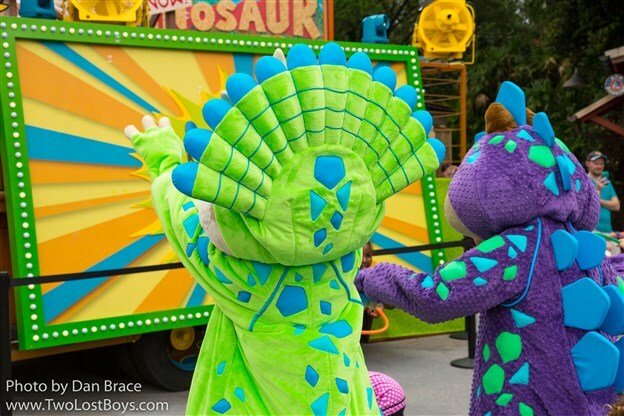 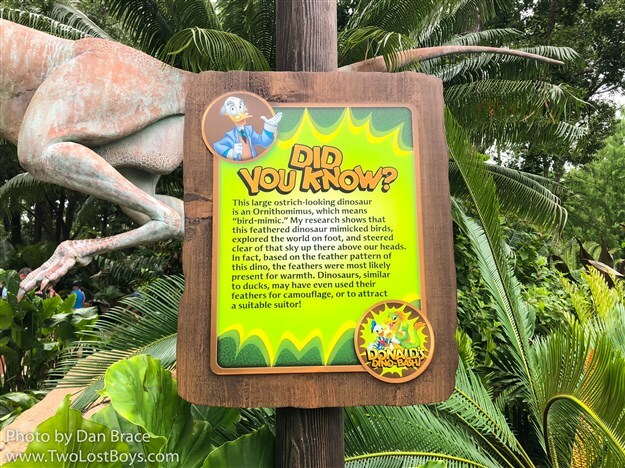 Disney have not stated when the Dino-Bash! 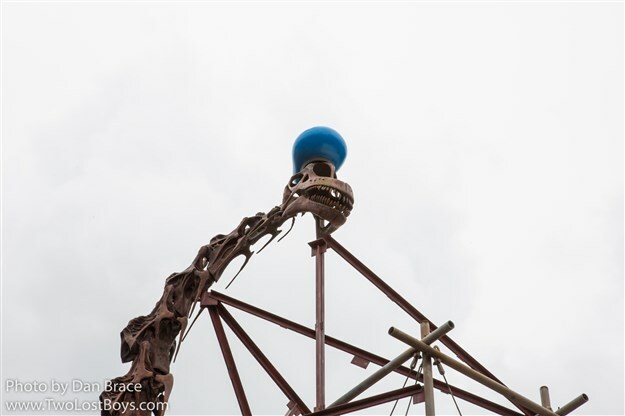 will end, and there is speculation that it will continue indefinitely until otherwise decided. 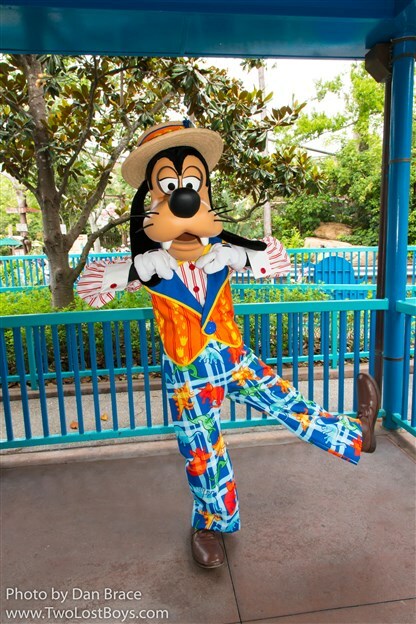 However, with there being eight characters appearing, plus the decor, dance party, treat and PhotoPass ops, I would not necessarily expect it all to stick around forever; I.E. 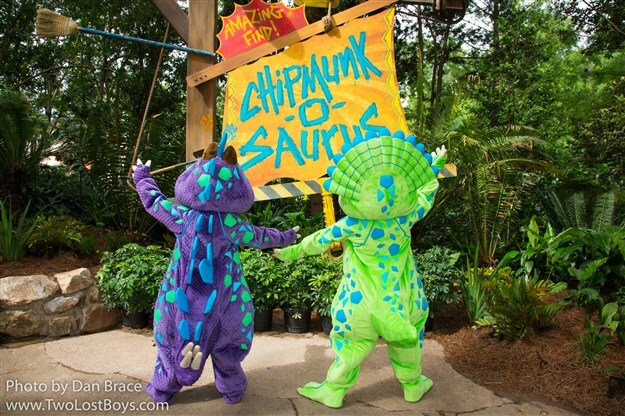 get there while the going is good as not to miss the Chipmunk-o-saurus magnificence, in case they get cut.